The first quarter 2009 economic data confirm that the recession has slowed the demand for just about everything in the U.S., including energy. As in prior recessions, consumption of gasoline has fallen as households cut back on their discretionary road trips. Demand for jet fuel is down as businesses put limits on their travel budgets. Natural gas consumption has fallen as energy-intensive factories operate at reduced capacities. If there is an unseen benefit hidden in the data, it’s that the prices for gasoline, jet fuel, and natural gas have also dropped far from their peak prices in 2008. In fact, natural gas futures dropped to a six-year low in late April; companies that were feeling good last year about their fixed-price gas contracts are out in the cold today. A recession usually dampens the rate of electricity demand growth for a few quarters, but this is no ordinary recession (Figure 1). 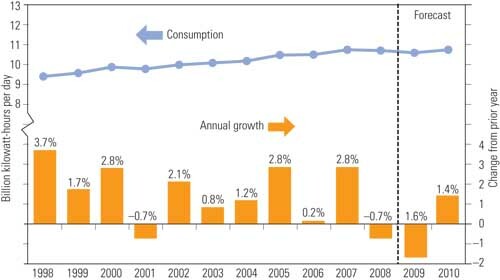 Projections of the total consumption of electricity in the U.S. during 2009 have been lowered... again. The Energy Information Administration’s (EIA’s) most recent estimates show that, for the first time in the history of the U.S., the consumption of electricity will likely fall for two consecutive years (2008 and 2009). Some utility executives privately admit that they are not optimistic that 2010 will rebound back into positive growth territory. 1. Updated U.S. total electricity consumption, 1998–2010. The most recent data released by the EIA shows electricity consumption in the U.S. dropping 1.6% in 2009 compared with the prior year. Source: Energy Information Administration. Residential consumption was down 2.5%. Commercial consumption was down 4.7%. Industrial consumption was down 13.8%. Electricity generated from coal was down 13%. Electricity generated from wind was up approximately 35%. Aside from being an interesting statistic, the reduction in demand for electricity is producing some unintended consequences for the operators of our electric grids. Coal-fired plants, which produce about 50% of the annual kilowatt-hours consumed by the U.S., may soon need to operate in a cycling mode instead of steady-state base-load. This change in operating mode is especially likely at night, when demand is lowest and when wind power production is highest. Because wind power has zero fuel cost, all of the electricity produced by wind will be taken onto the grid (except in transmission-constrained areas), and the balance of the electical demand will be produced by "must run" nuclear plants, hydro plants, and gas and coal generation units. Historically, simple-cycle and combined-cycle gas turbines have been ramped down or taken off the grid at night to handle demand reduction. But with so much new wind generation added during the past few years (and more coming), coal-fired plants may soon be cycled on a daily basis as well. The big challenge on the Texas ERCOT grid used to be planning for the summer peak demand and having sufficient operating spinning reserves. Not any more. According to Trip Doggett, ERCOT’s CEO, the big challenge today is to manage the minimum load at night with so much wind power on the grid. The ERCOT peak load is 64 GW, and the minimum load is 22.4 GW. Doggett notes that "by 2010, we could have almost 10 GW of wind power operating during the minimum load periods." He expects coal-fired plants to be turned down or turned off completely in some cases. "On average, there are 51 hours per year when the down-regulation of non-wind generation will be especially tough." It is difficult to know exactly how cycling will affect the maintenance costs and reliability of coal-fired units, as there is very little historical data. Since 2000, much has been learned about cycling with high-efficiency gas turbine combined-cycle plants that were designed to run at baseload and later assigned to cycling duty. Heat exchanger welds began showing fatigue and required more frequent repair. Certain models of gas turbines handled the cycling better than others did, but all gas turbines, even the aeroderivative units, had to be reevaluated to understand the effect of thermal cycling. The utility industry needs to gear up for an accelerated study on coal plant operation and maintenance with cycling. No matter what your opinions might be relating to climate change, cap and trade, and renewable energy standards, it appears certain that wind power will become a larger fraction of the U.S. generation mix during the next few years. At the April 2009 Gulf Coast Power Generation Association annual meeting, Denise Bode, CEO of the American Wind Energy Association (AWEA), wowed the 400-plus audience with data and AWEA’s political agenda. 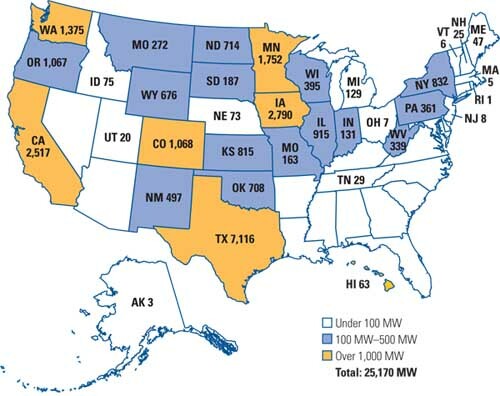 In January 2009, more than 25,000 MW of wind generation was operational in the U.S. (Figure 2). The rate of installation has been breathtaking during the past few years: 5,329 MW in 2007 and 8,300 MW in 2008. 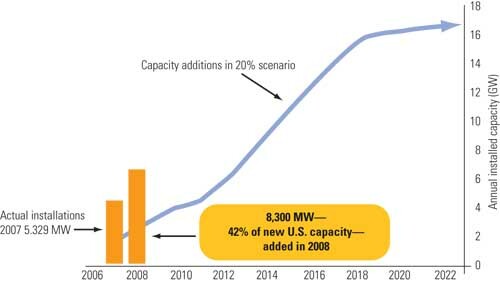 AWEA’s goal: to generate 20% of the nation’s energy from wind turbines by 2030 (Figure 3). Meeting AWEA’s ambitious goal will require substantial direct investment and indirect subsidies. The Economic Stimulus Bill signed into law on February 13, 2009, included several provisions that appear to provide those investments and subsidies. At the Platts Global Market Conference, Charles Turlinski of Horizon Wind Energy nicely summarized the bill’s effect on wind power development in a slide whose content is displayed here in the table. A thorough discussion of the tax credit options was presented in POWER last month ("Renewable Project Finance Options: ITC, PTC, or Cash Grant?" May 2009). With such generous subsidies for wind power, many of the experts at these conferences are predicting that more than half of the generation capacity added in the U.S. during the next three years will be from wind. But Ross McCracken of Platts cautioned that the excitement over wind energy downplays the problems with having such a high fraction of wind generation on the grid. Where does this leave the producers of fossil-fired generation, who are exposed to fuel commodity risk and potential carbon taxes? Where will the investment come from for the fossil fuel infrastructure needed to provide the reserve capacity for wind generation? Will the industry morph so that wind generation developers and aggregators include gas turbine capacity within their projects to cover the intermittency of wind generation? As with most energy conferences this year, more questions were asked than were answered.